With the K7 near the end of its lifespan, it seems as if every mainboard manufacturer worth its salt is making one last big push with socket A boards. Since nVIDIA recently rehashed the highly successful nForce2-SPP chipset under the moniker of the new nForce2 Ultra 400 name there is no better time than the present. 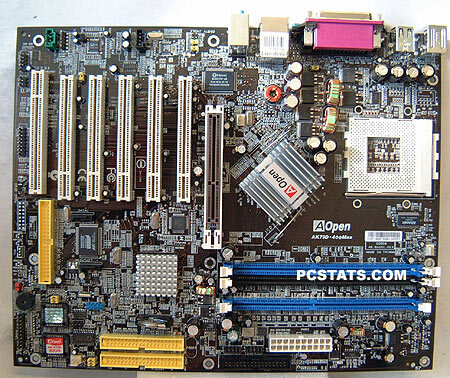 In this review, PCstats will be testing out the spiffy AOpen AK79D-400 Max mainboard which, obviously, uses the "new and improved" nForce2-Ultra 400 chipset. The Ultra name may be more symbolic than descriptive, but I would expect a little extra performance over stock nForce 2 chipsets at the very least - maybe even a little higher overclocking potential? Motherboard manufacturers have never packed so much into their products. These days if a board is sparse in terms of features, it's frowned upon. AOpen packs quite a bit into their AK79D-400 Max so critics remain content. The AK79D-400 includes Serial ATA/Serial ATA RAID, an additional Ultra/133 IDE channel, 5.1 audio (nVIDIA SoundStorm - the good stuff! ), IEEE 1394, 10/100 LAN and dual BIOS's. The five PCI slots should keep you happy for future expansion and the three DIMM's support up to 3GB of PC1600/2100/2700/3200 DDR memory. The board can be used with 200/266/333/400 MHz FSB based Athlon processors. The layout of the AK79D-400 Max is identical to that of the AK79G-Max which PCStats reviewed earlier this year. It's not surprising as the the only real difference is the update nForce2-Ultra 400 chipset. The general layout of the motherboard is pretty good, it's nice to see AOpen have placed the floppy and main ATX power connectors to the right of the DIMM slots. Since the MCP-T Southbridge generates a lot of heat, it's reassuring to see a small passive heatsink there. I'm very happy to see that board is bundled with useful software - hopefully this will be a growing trend. AOpen include Norton AntiVirus 2003 (IMO the best Antivirus software) along with the AK79D-400Max. With the number of viruses floating around the internet, a good virus protection program is just one less thing to worry about. I was also pleased at how detailed the accompanying documentation was. 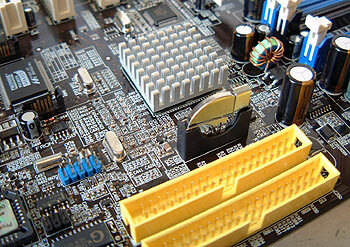 Novice should have no problems installing the motherboard if they have to reference the manual for advice. Unfortunately, AOpen did not address the few issues we brought up when we reviewed the virtually identical AK79G Max mainboard previously. First and foremost, is the way the CMOS battery is oriented; standing up on edge via three solder points means that it's very fragile and could potentially get snapped off easily. I'm not sure why AOpen decided to equip the northbridge with a passive heatsink instead of an active one... The nForce2 chipset can generate a lot of heat under intensive applications and this seems a bit counter productive.